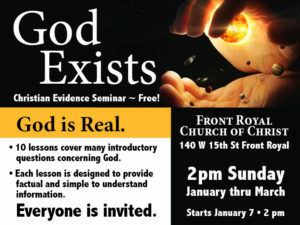 The Church of Christ in Front Royal will be hosting a workshop presenting Christian Evidence, “God Exists”. There will be 10 lessons covering many introductory type questions most people have concerning God. How did we come to the theory there is not God or God cannot be proven. Subsequent topic will be “Cause and Effect” Design, Morality and Creation VS Evolution to name a few. Each lesson is designed to provide factual information to the reader in simple to understand format. Interested persons may preview the lesson below. Audio recording will be added as they become available. We invite all to come to our special service time 2:00 pm each Sunday afternoon January thru March for a honest discussion of the facts concerning the existence of God. We pray you enjoy, and profit from, the Christian Evidences Study Courses. May God bless you all. 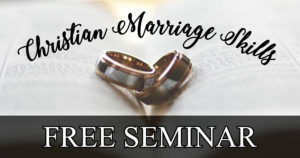 The audio of each lesson will be added as the seminar is completed.